Home » Canada Immigration » Canada Express Entry 7th draw – What you should know? This entry was posted in Canada Canada Immigration and tagged Canada Express Entry Visa on April 16, 2015 by Blog Author. 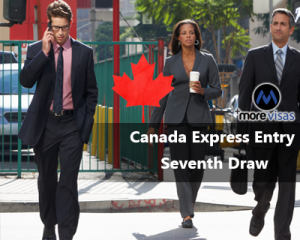 Are you waiting for Canada Express Entry seventh draw results? If yes, then it is your time to check whether you were chosen from the pool or not. Canada, the dream destination for every skilled worker offers enormous opportunities for workers who desire to work abroad. With ample career opportunities and fantastic pay scale options, Canada has much in store to provide for skilled workers at all levels. Its strong intention to lure more skilled workers to the country has paved the path for the new electronic system-Express Entry. On 1 January 2015, the Canadian government has introduced an Express Entry system to expedite the immigration process for skilled professionals. Starting from January, anyone who is interested to apply for Canadian permanent residency must qualify in Express Entry system. Under the new system, applicants must score adequate points in Comprehensive ranking system and should satisfy the criteria of federal economic programs. Under Express Entry, draws will be conducted on a regular basis to pick the candidates to send an invitation. Canada Express Entry Seventh draw was held on 10 April 2015, in which Citizenship and Immigration Canada has issued 925 ITA's to all those candidates who have scored at least 469. This Canada Express Entry draw has issued invitations to candidates who do not hold either a valid job offer with the Labour-Market Impact Assessment or the Provincial Nominee certificate. So, seven Canada express entry draws were held, and CIC has issued 7776 ITA’s in total for prospective candidates. Individuals who got an invitation through Canada express entry draw can file an application for Canadian permanent residency under any of the federal economic programs. The program under which you can apply will be given in the invitation, and you need to satisfy the requirements of that particular program to apply for Canadian permanent residency. So, if you have scored more than 469 points, then be ready to apply for Canadian permanent residency. If you want to apply for this system, fill out our Enquiry Form, so one of our visa expert will approach you soon.